“Blindspotting” follows the final days of protagonist Collin’s (Daveed Diggs) probation after his release from prison for committing a violent crime. Collin works for a moving company with his childhood best friend Miles (Rafael Casal), a clever plot device that allows for the two characters to participate in misadventures in the rapidly gentrifying Oakland, Calif. The plot ultimately culminates in a jarring conversation about privilege and Miles’ recognition of his own whiteness. A film rookie alongside writers Diggs and Casal, director Carlos Lopez Estrada beautifully depicts the duo’s story. His sweeping crane shots depict the multi-colored Oakland. Close-ups of various characters staring at each other brilliantly evoke one of the film’s most prominent themes — the Rubin’s vase — a visual puzzle that allows the human eye to see one part of the picture or the other, but never both at the same time. The film’s buddy comedy nature deftly tackles discrimination against black men, as well as the gross fetishization of the irresponsible white man trope. Collin, a black man, often finds himself cleaning up Miles’ reckless decisions. Blamed for Miles’ obnoxious honking during a moving trip, Collin tries to explain that it wasn’t his fault. Unfortunately, his dreads make it impossible for the outside world to see him as an innocent man. In a more harrowing scene, Miles’ son is found playing with his father’s gun. Miles’ wife Ashley (Jasmine Cephas Jones) upbraids Collin for letting Miles buy the gun in the first place. This blame game demonstrates the systemic racism that Collin faces even inside his best friend’s home, until it unravels and the film finally holds the white man accountable for his actions. 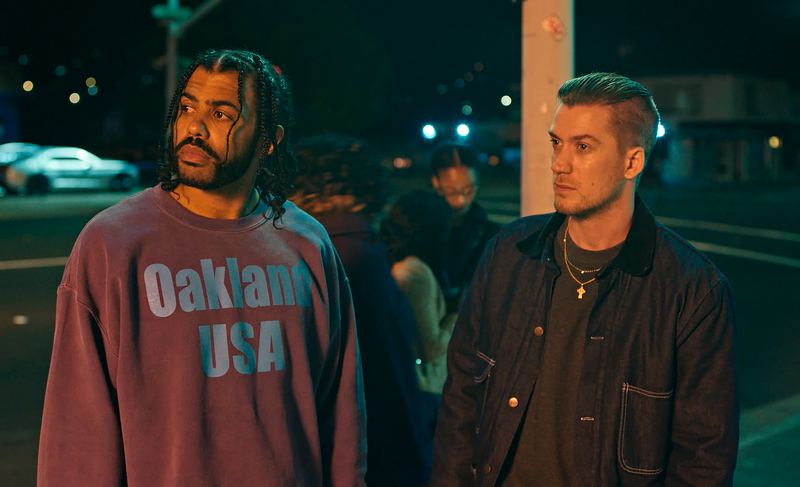 “Blindspotting” aggressively displays the characters’ distaste of Oakland’s colonization, which occurs in the form of a hipster invasion. Opening with a lyrical lament of the pair’s favorite fast food joint (that now serves vegan burgers), the film clips along into scenes where we watch Miles buy single cigarettes in the same convenience store where Collin buys egregiously overpriced green juice. Miles’ toddler son even gifts his father a t-shirt that reads, “Kill a hipster, save your hood.” The juxtaposition of the influx of trends and fads that white millennials bring from places like Portland, Ore., and Los Angeles with more “hood” elements traditional to Oakland is a source of comedy for the film, but the more serious economic and cultural implications of gentrification are side-stepped. In the film’s most heightened scene, a customer (Utkarsh Ambudkar) at the moving company’s headquarters recognizes Collin from the incident that had him incarcerated — the violent beating of a hipster outside of a bar where Collin and Miles were bouncers. This random storyteller serves as a colorful deus ex machina, as he recounts the incident to his friend at jet speed, despite Collin’s protests. Collin’s easygoing attitude and intentional avoidance of the subject prior to this scene builds the idea that Collin was perhaps wrongfully incarcerated on a silly and racist technicality. In reality, Collin had engaged in a violent and irresponsible act, forcing the audience to come to terms with more complicated aspects of the incarceration system. The prevalence of rap in the film tonally elevates the film from naturalism to a kind of magical realism. Miles emphasizes the benefits of making speech sonically pleasing and “bouncy” in order to be heard. The duo is seen riffing throughout various parts of the film, livening up otherwise mundane scenes. At the red carpet screening of “Blindspotting” at the Atlanta Film Festival, Diggs said that incorporating rap authentically was an important part of creating the film. The dichotomous nature of Miles’ and Collin’s personalities initially seem to balance each other out. It soon becomes apparent that the two feed off each other in an unhealthy way, though, especially in a final scene that depicts Collin’s reactions to police brutality after Miles comes to terms with his own privilege and whiteness. Casal said that he and Diggs wrote characters that were compilations of people that they know in order to convey their message. Diggs called “Blindspotting” a “comedy in a world that won’t let it be” in various interviews. The film deals with heavy subject matters, such as police brutality and the prison-industrial complex, but its comic nature normalizes the discourse surrounding race. The film may be about race, but it’s a classic buddy film, which might make the conversation slightly easier.